What’s Christmas without some peppermint? Since I shared the perfect cut-out sugar cookies yesterday, I had to show you a fun little twist for Christmas. 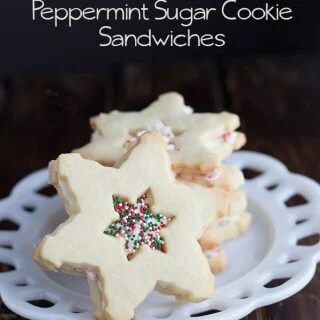 Peppermint sugar cookie sandwiches is what I came up with. 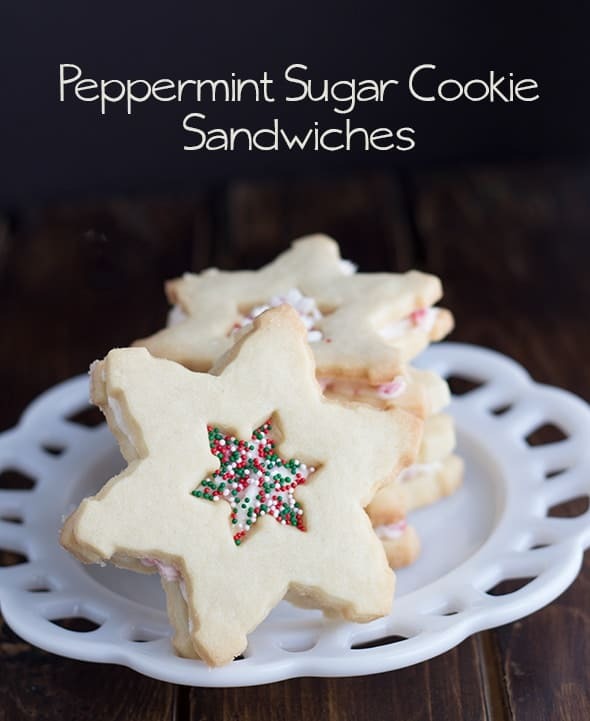 Whew, I got some peppermint up on the blog just in time for Christmas. I can rest easy for a minute! 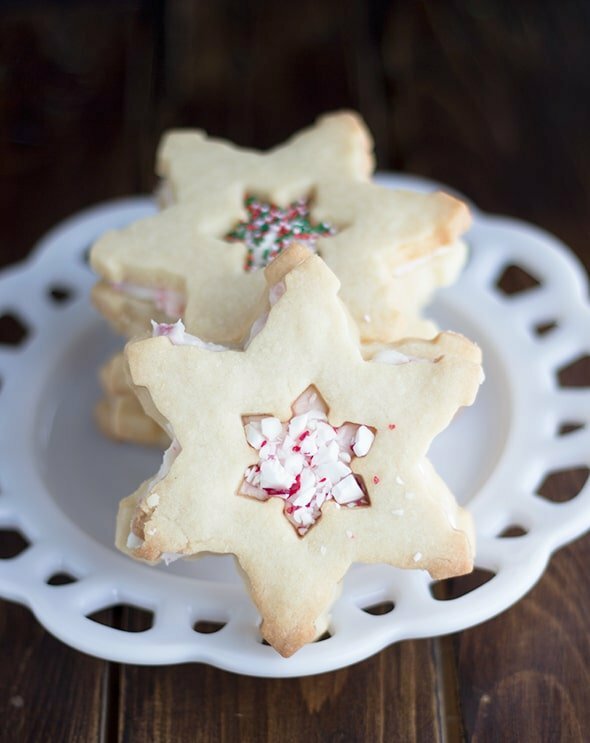 These festive sugar cookie sandwiches are incredible! They’re minty, buttery, and have a slight crunch. The crunch is more so from the pepperminut crunch in the sandwich frosting rather than the cookie. The cookie becomes soft. It’s like eating a heaven sammich. 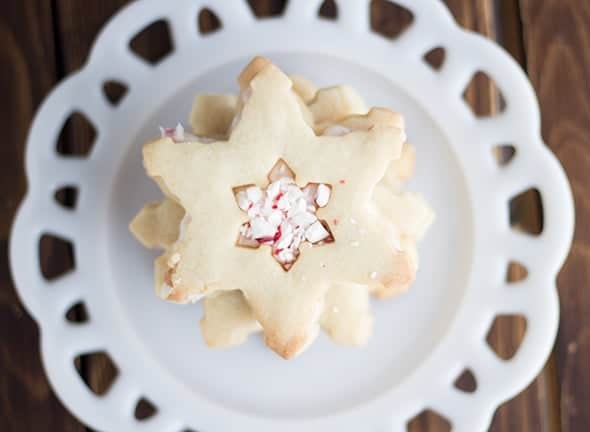 I think when you add the small cut out in the center of the cookie and combine that with the frosting peaking out and festive sprinkles, it really pulls the sandwich together. 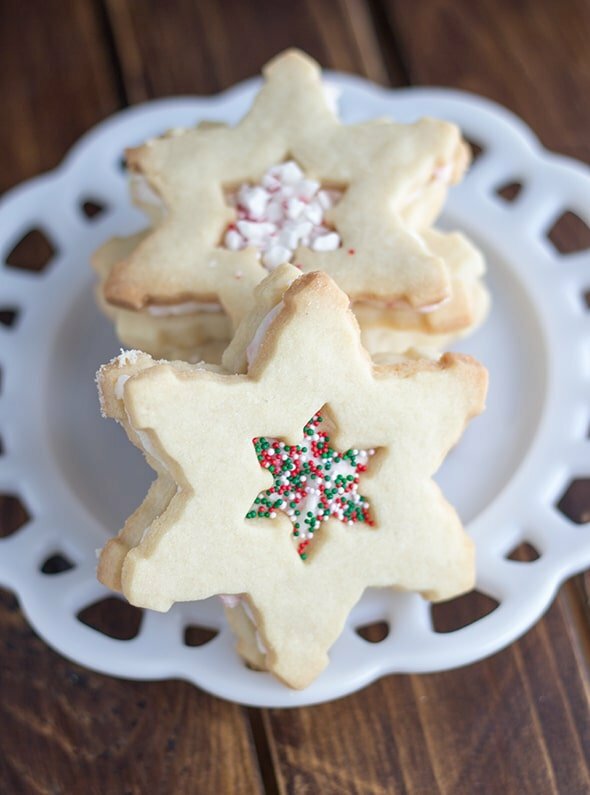 It brings a little something special to these cookies. On another note, there are only 6 days until Christmas. Tomorrow after the husband finishes working his overtime, we’re going to brave the crowds and finish our shopping. We don’t really like to leave our little guy with a babysitter, so he’s coming with. Yes, we still have some shopping to finish for him. It will be tricky, but I think we can get sneaky with it. I used some really great ingredients that came with my baker’s box subscription for these cookies. Stay tuned in for next week! A review and giveaway of my bakers box will be on the blog and you won’t want to miss it! Prepare and bake your cookies! Let them cool completely. My batch made 34 cookies so I had about 17 sandwiches. In a medium bowl, add in the butter and powdered sugar. Beat on low until most of the sugar is incorporated. Add in the peppermint oil and milk. Start with 2 tablespoons and add the additional if your frosting is still too think. Mix on high until light and fluffy about 1-2 minutes. Stir in the peppermint crunch with a spatula. If you don't have peppermint oil such as LorAnn's Oils, use about 1/4 tsp. to 1/2 tsp. of peppermint extract. The oils are much stronger than the extracts. Do you love or hate peppermint? I would love to hear! This is such a pretty cookie and looks so tasty! Pinned! Thank you! It was one of my favorites this year! OH MY! 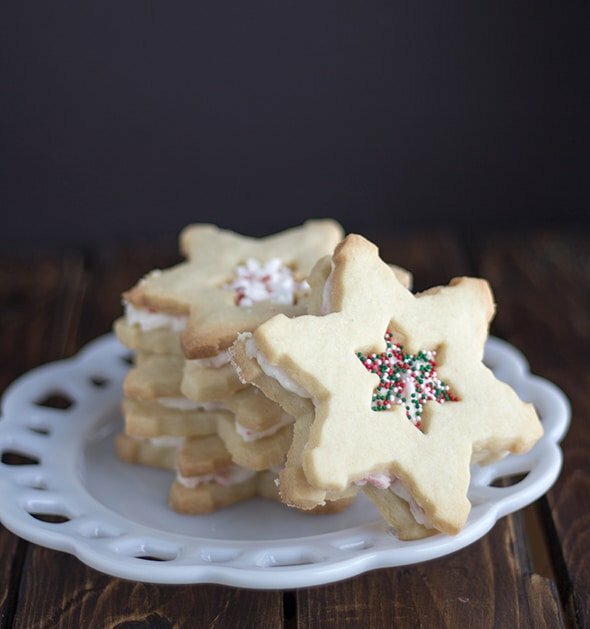 These cookie sandwiches scream CHRISTMAS! I particularly love these cookies. I love the collection of wonderful recipes in your space. As I am new to your blog, would like to invite you to my blog as well. Merry Christmas in advance. Stay in touch! Thank you so much! I’m finally headed over. I’m a little delayed on getting back to the comments! 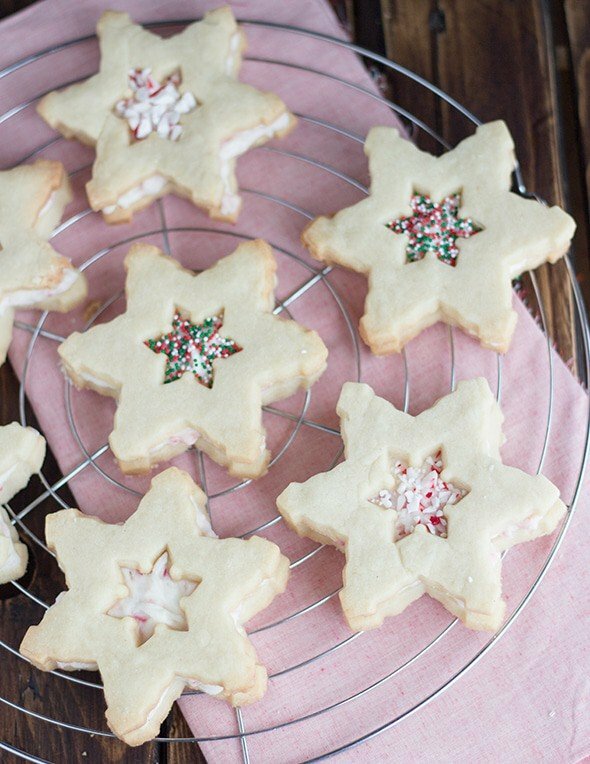 These cookies are gorgeous, I bet they are yummy too. I love the name of your blog, I’m a new follower on Google+. I hope you & your family have a merry Christmas eve! They were so yummy! Thank you. 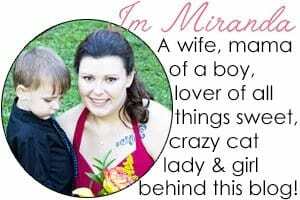 My hubby came up with the name of my blog. lol It’s kind of a play on Romeo and Juliet.